You don't have to leave home for a dose of culture and history. If you're looking for free vintage crochet patterns, try the Navajo Afghan. This easy crochet pattern has a rustic striped pattern with a Southwestern spice. Crochet this for your favorite armchair to give it a pop of color. Crochet blanket patterns with a vintage flair bring character and style into your home for a small price. The Navajo Afghan is one of the best vintage crochet patterns around. 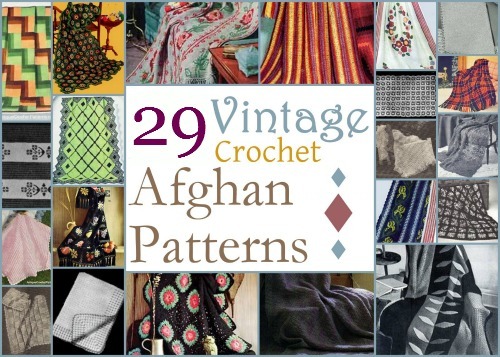 Get more free vintage crochet patterns here: 29 Vintage Crochet Afghan Patterns! I am a seasoned crocheter but don't understand the instructions. Am stumped at "Cut off remaining chain, do not turn." Am I supposed to actually use scissors to cut off the portion of chain not used??? Have never heard of anything like this. And, once this is done, I have no idea how to start the second row without turning my work. Is there a video that shows how to make this afghan? I searched youtube with no luck. Thanks. I like this pattern for the Navajo Afghan. After reading the pattern I see that is very interesting that you are adding and subtracting stitches through out the afghan. This makes a pretty looking pattern. The colors are go well together too. I can't wait to try this afghan pattern. Thank you so much for sharing this free pattern. I like the color combination of this Navajo Afghan. I've always loved the colors, gold/black/off white combination in anything. Here's the link to the pattern http//www.freevintagecrochet.com/afghans/navajo-af == ghan-pattern.html.